When pressed by a user on Apple's recent decision to cancel its Xserve line of rackmounted servers, Chief Executive Steve Jobs allegedly revealed that "hardly anyone" was buying the hardware. The e-mail reportedly sent by Jobs came in response to a user who lamented that Apple was abandoning the professional market. In the note obtained by Mac Generation, the user pleaded that Apple continue to offer its rackmounted servers. Jobs allegedly responded on his iPhone: "Hardly anyone was buying them." Last week, Apple revealed that it would discontinue its Xserve hardware after Jan. 31, 2011. Users have been asked to transition to new hardware, including a new Mac Pro Server configuration that Apple began selling on Friday. Apple also talked about the sales rankings of its server hardware in its "Xserve Transition Guide" released last week. In it, the company revealed that the Mac mini with Snow Leopard Server has been the company's most popular server system since its introduction in the fall of 2009. Jobs has been known to respond to e-mails sent to him by users. He has even cited those e-mails publicly, quoting one at this year's Worldwide Developers Conference. "I was sitting in a cafe with my iPad, and it got a girl interested in me," the note read. "Now that's what I call a magical device!" Of course, faking an e-mail is also possible, and makes any note reportedly sent by someone as prominent as Jobs suspect. 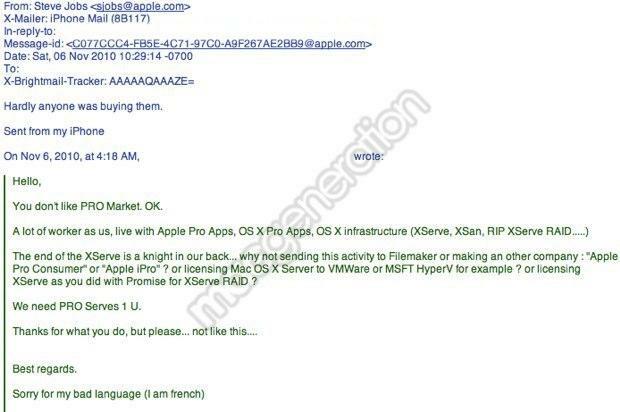 Earlier this year, a phony e-mail exchange was offered for sale to a number of sites, including AppleInsider, before one technology publication purchased the fake conversation and published details from it. Apple's public relations department quickly responded by outright denying the exchange.